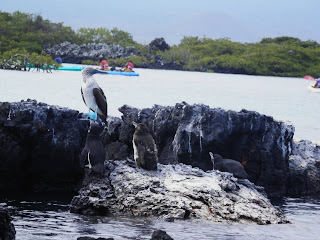 I traveled to the Galapagos Islands while I had a vacation from my teaching job here in Ecuador. I was in the Galapagos for about 6 days, and I visited four islands: Santa Cruz, Isabella, San Cristobal, and North Seymour. These are my 6 tips for what to see and do and how to be a sustainable eco-tourist. Otherwise, all of the guides are bilingual and will often translate what they say from Spanish to English. That being said, I booked my plane ticket through LATAM directly from Quito. If you are traveling from the United States I also recommend booking through LATAM. There is a $20 transit card fee that you buy at the airport and then another $100 fee to enter the islands. If you have a national visa or are Ecuadorian though, the fee to enter the islands is around $5. This tip is especially important because cruises that last between 5-8 days are not environmentally sustainable. I have also heard that the large luxury cruises do not benefit the local people, which is an important aspect of sustainable eco-tourism in the Galapagos. The cruises can also cost between $1000-$6000 dollars, and you do not necessarily get the same experience as going from island to island on your own. Can Tourism ever be Sustainable in the Galapagos? This "almuerzo" includes fish with peanut sauce, fries, rice, and salad. sometimes a dessert to top things off. An important tip I cannot stress enough is the importance of bargaining. If you are confident in your Spanish you can often reduce a hostel price from $15 to $10 or even an expensive seafood course from $18 to $15. I believe you can also try bargaining in English, though I mostly did it Spanish. Either way Ecuadorians expect you to bargain, so you should never accept the first price they give. Of course, this is within reason. If you pay about $3-5 in almuerzo that’s a pretty standard price. If you are like me and also enjoy trying out the local cuisine of a new place, bargaining is especially important for high cost seafood dishes. A Lang Iguana. One of many unique species you can see on the islands. The temptation to touch Galapagos animals is strong, but don’t do it. For example, touching the babies of the Sea Lions is bad because our scent can rub off on them, making their mothers reject them. In other words, when you get to the islands don’t be like other tourists who get within a foot of the animals, try to feed them, or touch them. We need to respect that this is their habitat, and that we’re just lucky enough to be visiting them. Now, you can plan what you want to do ahead of time. If you are interested in snorkeling and swimming with sea lions and sharks you can go on the Tunnels tour which is about $100 or the Tintoreras tours which is about $40. Both activities are on Isabella Island. You can also do plenty of free things such as visit the Charles Darwin Research Station at Santa Cruz or lay down on several of the beaches at Santa Cruz or Isabella. I recommend 6 days especially to get accustomed to boat travel between islands. You can certainly stay longer, but I found that I was pretty tired of the beaches after 6 days. I also recommend 2 days in Isabella, 2 days in Santa Cruz (1 day to do a cruise, and maybe 1-2 days in San Cristóbal. In other words, tourism can be sustainable if it economically benefits a community, but not all tourism is “eco-tourism.” For the Galapagos Islands sustainable ecotourism is important for the economic well-being of the people and the environment. The Galapagos has a history of exploitation and degradation by pirates and buccaneers that have taken advantage of the Giant Tortoises oil and carapaces for commercial use. Being conscious of the water you use and making sure to turn the light off when you leave your hotel room are all important ways of being a sustainable eco-tourist. Also, be conscious about when and how you choose to visit the islands. Peak holiday seasons aren’t always the best because too many people can be damaging to the natural environment. I hope these tips are helpful when you plan your own visit to the islands. I personally believe that everyone, natural lovers, naturalists, teachers, and conservationists alike, should visit the Galapagos Islands. But it’s up to you have an experience that benefits you, the local people, and the environment. Look for future posts where I go into more detail about the animals you can see in the Galapagos and the kinds of activities you can do. Thanks for reading and Hasta Luego!